Just before 6AM, the Falcon Cam showed the chicks huddled in the corner with the female perched outside the nest box, keeping a close on her brood. 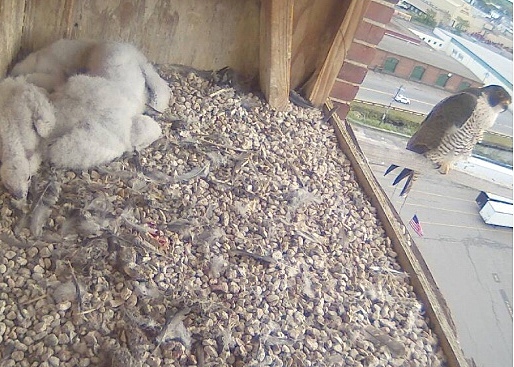 Around Day 15 the chicks are beginning to enter the hunchback phase, during which they are often seen in a hunchback pose, with their feet splayed out in front and head angled forward. ← 4 Chicks: where did they go?